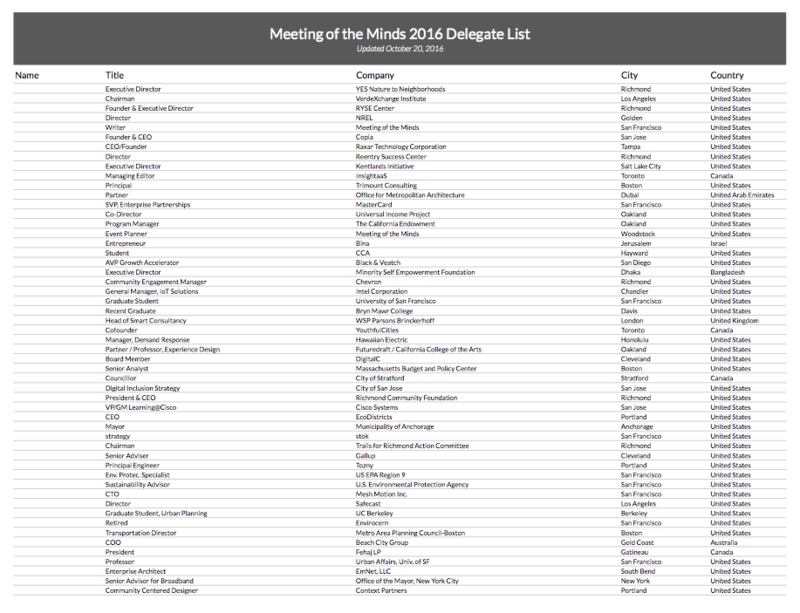 Who Attended the Meeting of the Minds 2016 Annual Summit? Meeting of the Minds is the longest running urban sustainability and smart cities conference in the world. Thousands of professionals have attended our events over the 10 years that we have convened, and one thing is clear: each Meeting of the Minds attendee is an expert in their own right. They each offer deep knowledge of their practice areas to each other through networking, workshops, delegate-led sessions and partnership building. The annual Meeting of the Minds summit is limited to 400 VIPs, and it has been that way since the very beginning. Our goal is to create a concentrated, curated, thoughtful group of interdisciplinary leaders committed to a sustainable urban future. Most of our attendees are decision-makers in their organizations, and they come from a wide variety of sectors, backgrounds and cities.